SIMPLY GORGEOUS design is an accent to any kitchen counter top. 18"x12"x3/4"
100% MONEY BACK GUARANTEE. We have made every effort to make you absolutely happy with this product. If for any reason you won't be satisfied with your order, simply send it back for a 100% refund! No questions asked! MONEY BACK GUARANTEE. 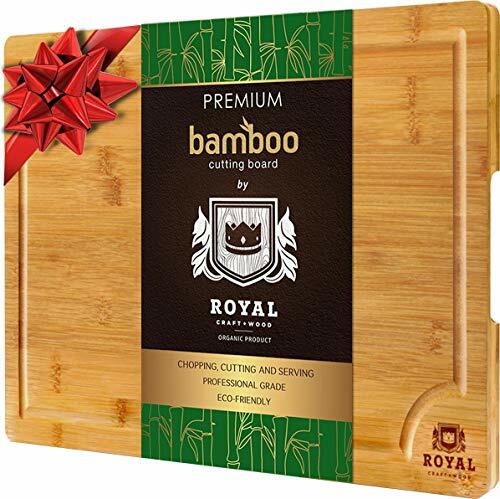 We take pride in the quality of our Bamboo Cutting Board and this is why we back it with 100% Money-Back guarantee! Buy with confidence and enjoy an award winning design and its multifunction usage! If you are not absolutely thrilled at it, we will fully refund you, NO QUESTIONS ASKED! PROFESSIONAL GRADE, KNIFE FRIENDLY: Bamboo won't cause excessive wear and tear to cutlery. If you have any questions about this product by Royal Craft Wood, contact us by completing and submitting the form below. If you are looking for a specif part number, please include it with your message.